Bold and beautiful, big diamond platinum engagement rings are stunning pieces of jewelry perfect for confident brides-to-be. From the ring design to the diamond shape to the setting type, there are many ways to enjoy gorgeous big diamond rings on any budget. A simple, classic choice is always a diamond solitaire engagement ring, and choosing a stone larger than a single carat is sure to be eye-catching for its sheer size and traditional beauty. You can click on 'buy now' to see purchasing information for any of the rings in this slideshow. To make any center stone seem larger than life, choose a delicate pave setting that gives a "diamond dust" look to the ring's band. This enhances the size of the central diamond and gives the ring incomparable sparkle. A halo setting surrounds a center stone with a uniform ring of smaller diamonds, making the center stone seem even larger and more brilliant, with accent stones down the sides of the ring's band. Round diamond shapes are the most popular for this design, but cushion and princess cut stones are equally appealing in similar box settings. Adding a split to the ring's band gives it instant distinction and makes the ring seem larger without adding bulk. Splits on either side of the center stone enhance the length of the focal diamond, and a pave setting along the band increases the ring's overall brilliance. Make a big impression with a platinum diamond engagement ring by choosing a setting with intricate details. Pave stones offset from the surface of the band and extra accents on the sides of the ring's crown are elegant ways to make your engagement ring larger than life without going overboard in size. Adding accent stones is an easy way to increase the size of a diamond engagement ring without bulking up the center stone. Coordinated side stones give the ring dimension and beauty, and many couples also opt for three stone engagement rings with their past, present, and future symbolism. An eternity band paired with a larger center stone is an instantly stunning ring, particularly when crafted in bright platinum. If you prefer a single diamond in your engagement ring, consider a unique setting that highlights the stone with vintage flare. Opt for a filigree design for delicacy and beauty. One of the easiest ways to create the illusion of a big diamond ring even with smaller stones is to choose diamond shapes that maximize the visual appearance of the gem. Elongated shapes such as marquise, emerald, oval, and pear cuts always look larger than round or princess cut stones of the same weight. Make your center stone go above and beyond by choosing an elevated setting. This gives the ring added height that emphasizes the center stone without needing a larger gem, but this can be an impractical ring design because the crown is more easily snagged and caught on other objects. This ring style is best worn only occasionally or kept protected by a ring guard. Adding texture to the engagement ring's band with different accent stone shapes, raised bridges, and pave settings are all ways to make the ring seem bigger but no less delicate. This type of elaborate engagement ring is popular with many brides because it can be easily customized for any center stone shape or design preferences. An easy, common way to make your engagement ring seem even larger is to choose a coordinating wedding band that will complete the set for one large diamond ring. Elaborate rings may require customized bands fitted around the central gem and ring shape, but simpler engagement rings work well with plain diamond bands or eternity rings. When you've chosen a big diamond platinum ring, don't forget the wedding ring to go with it. 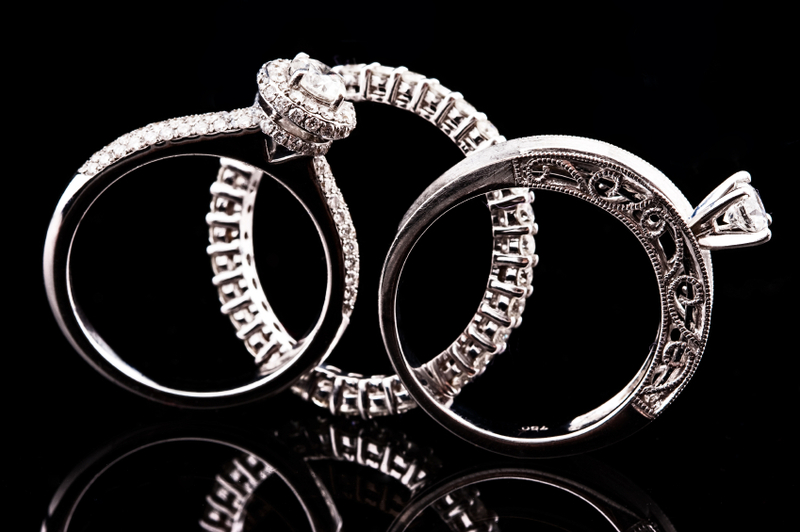 Many couples opt for platinum wedding rings because of their luster and beauty, and platinum is a durable precious metal that pairs well with diamond accents.